HOW IT WORKS: All #1 International songs of 2018 were included and ranked according to their longest stay at the No. 1 spot. The cut-off period for Inter Top 10 is from the first charting week of Feburary 2018 until the week of December 22, 2018. Watch the music videos of our Top 10 International songs of 2018 below! 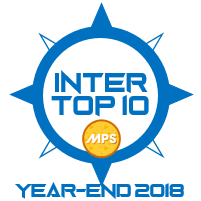 See what fans has to say about the Inter Top 10 MPS Year-End 2018 results! 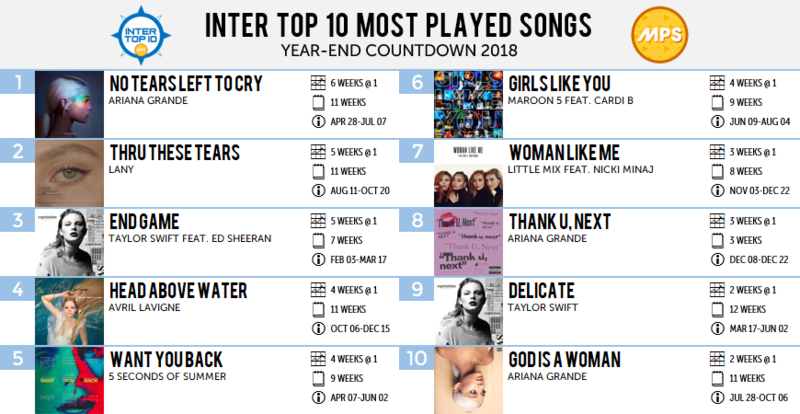 Ariana Grande dominates the Inter Top 10 year-end countdown this year with 3 entries including the number 1 song "No Tears Left To Cry" which spent 6 weeks at #1! Avril Lavigne and LANY also made their year-end countdown debut this year. Congratulations to all the songs and artists who made it to the Inter Top 10 Year-End 2018! Thank you for giving us a year worth of amazing music!